Everyone involved in student success benefits from our reporting. Insight’s vivid analytics tell a complete story—from the big picture to the individual student. See the whole community at-a-glance. Our dashboard gives you a snapshot of activity, posts, searches, and popular tags your students are using right now. Dive into the qualitative. Reporting platforms often focus on only quantitative data, but you know numbers never tell the whole story. Insight pairs quantitative analysis with rich qualitative data to give you new context on your students. Know your students better than ever. Check out a student's Insight profile to see what’s on their mind, what topics attract them, and what peer connections they're forming. Insight lets you see your students from a different perspective—how they self identify and how they evolve. Our forward thinking, secure technology monitors and manages potential safety risks. Customize your content monitoring terms. It’s quick and easy to add to our list of default content monitoring. Choose terms you’d like to restrict entirely or those that you’d just like to monitor. Manage your point of contacts. 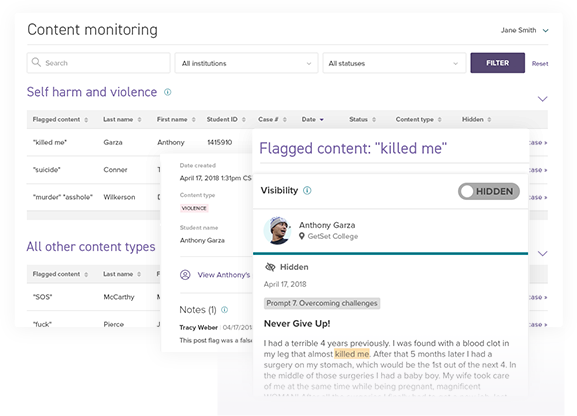 Customize the contacts for different content types— Send all self harm and violence alerts to your behavioral assessment team, or route all finance mentions to your financial aid office. We customize our process to fit your process. We'll tailor our content monitoring to match your policies and practices, so everything flows smoothly into your established system. Students open up on GetSet, sharing their ambitions, experiences, and even their honest insecurities. Our qualitative reports sort through these student interactions with on the fly analysis of trending terms in conversations across all of GetSet. Slice, dice, and segment. Filter down to programs, campuses, and more to learn what areas are of highest interest to specific populations. Stay on the pulse with sentiment analysis. We’ll help you learn not just when something’s being talked about, but more importantly, what attitude students have about a topic. Find your trendsetters. Subpopulation analytics expose which students are actually driving the trends in conversation. Expand understanding of your existing data. Start with trends you already follow, then let us recommend new cross sections of campuses, cohorts, characteristics, or topics that have things in common.